Asparagus, cream, and crispy cheese—what more could a girl want?? Hmmm, well many more things actually, but that’s a whole other discussion I had a lovely bunch of asparagus from my organic co-op and I was sick of always making asparagus the same two or three ways so here we are delving into the adventures of soup making. In my opinion, any soup that has cream in it is a winner. Don’t you agree?? 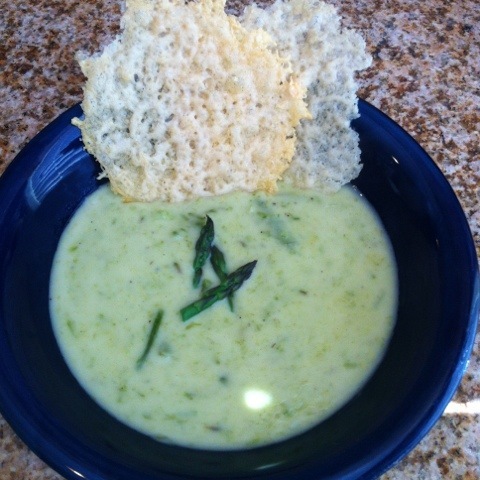 I started doing some research and found a million recipes for cream of asparagus soup so I just pretty much took a little from each recipe and molded it to suit my tastes and laziness. Some of the recipes had a ton of ingredients (which I’m sure made the soup taste delicious) but I was looking for something relatively easy that wouldn’t take a lot of time and make me spend a lot of money at the supermarket for things that would probably sit in my fridge and go to waste after this recipe. I’m also using an immersion blender for this recipe. That’s one of those handheld blenders, folks. If you don’t have one you should really think about investing in one. They’re relatively inexpensive and really come in handy in a bunch of recipes. It really beats having to get out the food processor or blender and then washing all those parts. Again, I’m lazy. Is it that obvious? Cut the bottom ends off the asparagus, I usually trim the bottom 2-3 inches. Then cut your asparagus into 1 inch pieces. Boil about 1.5 cups of your chicken broth and cook the asparagus until tender. Take out about a cup of the pieces and put them aside. Using your nifty immersion blender, blend the remaining asparagus and broth. Set it aside. In a large saucepan, melt your butter and whisk in your flour. Make sure it becomes smooth and you don’t have any visible pieces of flour. Pour in the remaining chicken broth and cream and keep whisking until it starts to thicken. Once it’s become thicker, pour in your blended asparagus and broth and keep stirring. You should have a nice consistency by now. If it’s too runny, just add a little more flour and whisk! Once you’ve achieved your desired consistency, toss in your asparagus pieces that you set aside earlier. You can spritz some fresh lemon juice in there, too. I didn’t because I forgot (whoops) but if you want to, go for it! Now onto the parmesan crisps! Please, please, please don’t use the powder cheese from a can or plastic bottle and no shredded cheese either. It ain’t gonna work, honey. Use a grater and some real parmigiano reggiano or even pecorino romano. Trust me. Line a cookie sheet with parchment paper. Pre-heat your oven to 400 degrees. Grate your cheese into a heaping pile and then flatten it down into a nice little circle on the parchment paper. Make sure you leave about an inch between each mound because they’ll flatten out when they cook. These require your undivided attention–they cook quickly–only about 3-4 minutes and you don’t want to burn them. Once they’ve turned golden and have flattened out, take them out of the oven and let them cool. They should lift right off the parchment paper! These are great for any soup, really. Or whenever. They’re just good. Who doesn’t like crispy, salty cheese?! Ummmmm, duh–this is a no brainer answer! ps. If, by chance, you’re wondering what I did with the leftover whipping cream I used for the soup?? 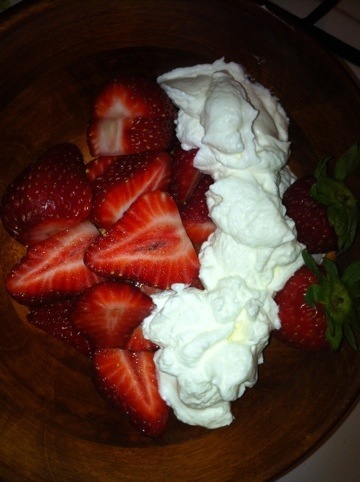 Oh yeah, you better believe I whipped it up with a teaspoon of sugar and placed it over fresh strawberries for a semi-sinful dessert! It’s fruit! It’s healthy, right? !